Named for the famous poet, Caedmon Records specialized in spoken word releases for decades. The company is best known to horror fans both for their classic albums featuring Vincent Price and for releasing some of the first commercially available audio versions of stories by H.P. Lovecraft. So when I heard that HarperCollins (who had purchased Caedmon in the 80’s) had been reissuing Caedmon materials from the archives under their HarperAudio division, I was very excited. But despite getting top billing on the cover, it should be noted how Vincent Price’s contributions to The Edgar Allan Poe Audio Collection are limited to the final 2 discs in this 5 disc release. Instead, the bulk of the work in this collection is performed by Basil Rathbone. This admittedly does make sense since he was Caedmon’s go-to guy for Poe readings until his death forced them to approach Price to take over. Besides, it’s not like Rathbone didn’t do his fair share of horror roles during his long film career. While this might be a disappointment to Vincent Price fanatics at first glance, it’s really not a problem as both actors provide excellent performances. And when I say performances, I mean it. Both men get to show off their acting skills in these recordings rather than take the easy way out by simply reading them. With no music or sound effects to distract from the stories, the listener is free to focus on the delivery of said stories. And believe me, their deliveries really shine in this collection. In addition to bringing a definite “horror” tone to “The City in the Sea” and portions of “The Bells” and perfectly conveys a sense of love and loss in his take on “Annabel Lee,” Rathbone also perfectly shows madness, anger and/or fear in “The Masque of the Red Death,” “The Fall of the House of Usher” and “The Tell-Tale Heart.” His performance in “The Cask of Amontillado” has to be heard to be truly appreciated. In “Ligeia,” Vincent Price shows that he has sorrow and mourning DOWN while in “Berenice,” he delivers perfect pronunciations of exotic terms and makes the ending extra chilling. “The Gold Bug” (which has more macabre imagery than one might think) features some especially amazing voice work during the code translation scene. The only negative is the voice Price uses for a slave character, but that’s admittedly due to how Poe wrote the character. Sadly, the audio quality itself is not without its problems. Almost all of the works performed by Rathbone have the volume suddenly get lower at random times only to return to normal sometime later. This usually happens numerous times and while turning up the volume can help at some points, it results in ear-shattering moments when it goes up again. After much careful listening, I can confidently say this is not due to Rathbone’s performance and it has to be some sort of technical issue. Vincent Price’s material is much more stable volume-wise although “Ligeia” has noticeably different audio quality than the other two Poe works presented on the same disc, presumably due to it being sourced from a different Caedmon release than the other two. As this release is made up of material from several separate vinyl releases, some works are presented with their titles given while others just leap right into the story. Another issue is how the packaging claims the readings are unabridged when they are clearly not. The most notable shortened tale is the presentation of “The Fall of the House of Usher” and the version of “Berenice” appears to be the toned-down version Poe released after the original was criticized as being too horrific. 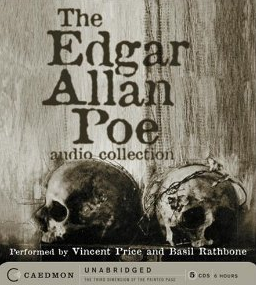 It’s worth noting, however, that the version of “Ligeia” used in this collection is the one that includes Poe’s “The Conqueror Worm.” I suspect this decision to use abridged versions was due to the space limitations of vinyl LPs, but don’t know if the unabridged claim originated with Caedmon or HarperAudio. The Edgar Allan Poe Audio Collection is packaged in 3 cardboard folding panels held in a cardboard box. Sadly, the panels are loose sleeves of sorts that let the discs move around in and potentially get scratched (especially since the second and third panels include two sleeves that hold the discs one on top of the other). Each disc lists the Poe works featured on them, along with the running time of each track (each work is contained on a single track). Originally presented on CD in 2000, HarperAudio reissued the 6 hour collection in 2012 with a reduced price (as noted on the slightly modified cover art). Given the issues with the audio, I applaud them for lowering the price, but can’t help wishing they had gone back and remastered the audio. Some more secure packaging for the CDs would have been nice as well. I also imagine that some listeners would prefer to have the longer stories spread across several tracks. As a Vincent Price fan, I’m happy his recordings didn’t suffer from as many issues as Basil Rathbone’s contributions to the collection did and will definitely go back to the discs featuring his work due to the easier overall listening experience. But seeing as how both actors made even stories I knew by heart seem exciting and new, I would happily pay for an improved version. If said issues are the result of damaged masters and are therefore impossible to fix, then some sort of notice on the box would be nice. Despite my issues with the album, I encourage HarperCollins to keep releasing horror materials from the Caedmon archives. After all, there are still several spooky Vincent Price albums in desperate need of a CD release (in addition to David McCallum’s readings of various stories by H.P. Lovecraft). I’m positive that issuing those titles on CD without the audio issues I noted above would result in rave reviews, in addition to bringing in a lot of sales. Special thanks to HarperAudio for the review copy! Sounds great. I think I will head to swapacd and see if it is available!